Who can book the Adastra Hall? How many people does the Adastra Hall hold? The hirer is responsible for ensuring that these numbers are not exceeded. The hall holds a Premises Licence which permits the following:- Plays, film shows, public entertainment, live music, recorded music, dance and the sale/supply of alcohol. The hall has Public Liability Insurance. If you are a Commercial Hirer, you must provide your own public liability insurance. All hirers should affect all necessary insurance to cover their own liability in respect of their own or third party equipment used or stored in the hall. Is the Hall suitable for a wedding? 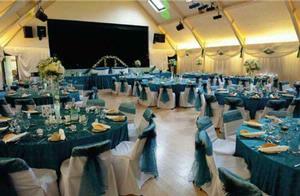 The Adastra Hall complex has provided the venue for many enjoyable celebrations. The village setting, next to Adastra Park, as well as the excellent facilities of the venue itself, all combines to provide a memorable day for any couple and their families and relations. 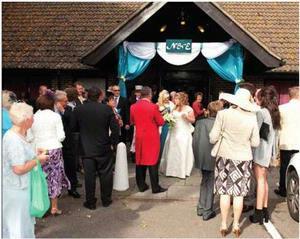 The perfect location for your wedding reception/party. Hirer will be met at the hall with a check list and keys for the building. After use keys must be put in Hall letter box. Please note hire fees will be charged at the rate applicable at time of use of premises.